On 27 March 2018, EDRi member Hermes Center for Transparency and Digital Human Rights filed a request with the Italian Data Protection Authority (DPA) to investigate on the widespread practice of logging Network Address Translations (NAT) by most of the telecommunication operators. To better understand the issue, we must first study, from a technical point of view, the operation and allocation of IP addresses by telecommunications companies, in particular, the practice of Carrier-Grade NAT (CGN), an approach used by telecommunications companies – and especially mobile operators – to manage the allocation of IPv4 addresses. Due to the shortage of available IPv4 addresses, it has become necessary to assign private IP addresses to customers, and then translate them into public IP addresses through a NAT procedure performed by devices connected to the internet operator network. In this way, a single public IP address can shield several private IP addresses: the direct identification of the unequivocal user that on “that day and at that time” was assigned to that internet identifier — similar to telephone numbers identification — is more difficult. According to the statements of law enforcement authorities (LEA), this practice complicates the operations of identification of those who commit crimes because, given a public IP address, there may be dozens of different users. A practice widely used by telecommunication operators to deal with requests for identification by the judicial authority is that of recording and storing all NAT operations between private IP addresses of its customers and public IP addresses: like this, all the connections of the various IP addresses to the internet are recorded. The Hermes Center demanded that the Italian Data Protection Authority perform a timely verification and inspection of all the main mobile and fixed operators in relation to the practices of data collection of internet traffic, publicly reporting the results, to verify which is the information collected for the purpose of providing compulsory services to the judicial authorities. A recently introduced Italian law on data retention has extended the retention time period by telecoms providers by up to six years. This data retention concerns both phone traffic and internet connections and clearly goes against the European data retention principles. On 13 October 2017, Europol and the Estonian Presidency of Council of European Union organised a workshop with 35 policy-makers and law enforcement officials from all around Europe, in order to discuss the “increasing problem of non-crime attribution associated with the widespread use of Carrier Grade Network Address Translation (CGN) technologies by companies that provide access to the internet”. The Hermes Center filed a Freedom of Information (FOI) request to Europol and the documents are available here: https://www.documentcloud.org/public/search/projectid:37909-Carrier-Grade-NAT-workshop-by-EUROPOL. In Italy, the Hermes Center has appealed to the Data Protection Authority, asking for inspection across all telecommunication operators in order to verify in great details which are the exact information elements logged to comply with data retention laws. The winners of the 13th edition of the Czech Big Brother Awards were announced on 15 February 2018 in Prague. The awards are intended to draw public attention to privacy issues and related alarming trends. The Big Brother Awards are based on a concept created by EDRi member Privacy International. In the Czech Republic, the contest is organised by EDRi member Iuridicum Remedium (IuRE) since 2005. An eight-member jury comprising of experts on new technologies, lawyers, human rights defenders as well as journalists chose the winners out of forty nominations sent in by the general public. The awards in four different categories went to the Ministry of Industry and Trade, Member of the Parliament (MP) Jiří Běhounek, Equa bank, and the Office of the Government. Non-profit organisation Open Whisper Systems won the positive award, named after Edward Snowden. The award for the biggest privacy intruder in the long-term perspective went to the Ministry of Industry and Trade – the Ministry in charge of the Electronic Communications Act containing legislation related to data retention, which defines the obligation of providers of electronic communication services to collect metadata and store it for the needs of police and other authorities over a period of six months. Such data is very sensitive as it reveals who was involved in the communication as well as the whereabouts of the users of communication services. The Court of Justice of the European Union (CJEU) has already twice identified such data collection as unacceptable and unconstitutional. In addition, statistics show that this massive collection of data does not result in the decrease of the number of crimes committed nor in the increase in cases successfully solved by the police. Moreover, as is often the case, this measure is most likely to hit all others but the intended group of people – individuals involved in organised crime know how to avoid it. “The jury decided to award the Ministry for its inactivity in a situation where fundamental rights of all citizens are being undermined,” said Jan Vobořil, executive director of IuRe. The award for the biggest business privacy intruder went to Equabank for forcing its clients to agree to provide the so-called TelcoScore – which is based on the data from mobile phone operators. A typical use of TelcoScore is to verify the client’s credibility. The bank requests it from a telecoms company providing such information. The score is calculated based on 60 different data that the operator has about the client. Although clients are asked to agree with this procedure, in practice they cannot avoid it. This trend is dangerous, as it leads to a situation where clients will have no other option than to agree. “The score is calculated based on unrelated data, such as the client’s whereabouts, mobile phone use, number of journeys abroad, frequency of exchanging the telephone, and so on. “This can mean that in the future our actions can have unexpected impacts in other unrelated areas of life – and this could lead to permanent stress, conformism, and self-censorship,” explained Voboril. All three biggest mobile phone operators present on the Czech market do currently sell customer data in this way. The award for biggest administrative privacy intruder went to MP Jiří Běhounek for his proposal for an amendment to the Act on Health Services that introduced an unrestricted access to electronic healthcare documentation. As part of the Electronic Identification Act, it passed through the legislative process. It establishes a so-called National Contact Point, through which broad access to electronic medical documentation, including access from abroad, should be facilitated. Alarmingly, there are no limits to this, nor does the legislative text mention whether the patient can influence which data is shared and how. Last but not least, the positive awards named after Edward Snowden goes to Open Whisper Systems which developed Signal application for encrypted mobile communication. Signal is an encrypted communicator designed primarily for mobile platforms (Android, iOS) for messaging and voice messaging. It can encrypt text messages, pictures as well as phone calls. Signal is now generally regarded as the most secure communication platform in terms of encryption. It has two major advantages. The communication is end-to-end encrypted, which means that only the end users themselves have access to its content. The second advantage is that Signal is an open source application meaning everyone can check what happens with the data. A number of “working documents” discussed as part of the Council of the EU’s “reflection process” on the mandatory retention of telecommunications data have been released following an access to documents request submitted to the Council by EDRi member Statewatch. The documents provide an insight into some of the issues that have been discussed by Member States’ representatives and EU agencies who, since March 2017, have participated in a sub-group of the Council’s Working Party on Information Exchange and Data Protection (DAPIX) to “facilitate a common reflection process at EU level on data retention in light of the recent judgments of the Court of Justice of the European Union”. The documents include overviews of the legal framework for telecommunications data retention in the Member States, a presentation from Europol on the possibility of introducing a new measure on “targeted data retention”, and proposals for using the forthcoming ePrivacy Regulation to make possible some form of data retention. It can be observed that the use of working documents does not serve the interests of transparency, as they are not automatically listed in the Council’s register of documents and will likely only become available to the public through dedicated requests or leaks. Statewatch requested access to all minutes/“outcome of proceedings” produced by the Council working group “DAPIX (Friends of Presidency) – Data retention” and all working papers/non-papers/other documentation submitted to that working group. Some documents were released in full, others were released in censored form while others could not be released at all, on the basis of argumentation from the Council’s transparency department. European policy makers are working on the largest internet filter we’ve ever seen. That might sound a tad dramatic, but it’s really not an overstatement. If the proposal is accepted, websites such as Soundcloud, eBay, Facebook and Flickr will be forced to filter everything you want to upload. An algorithm will be the boss over which of your uploads will be seen by the rest of the world and which won’t. 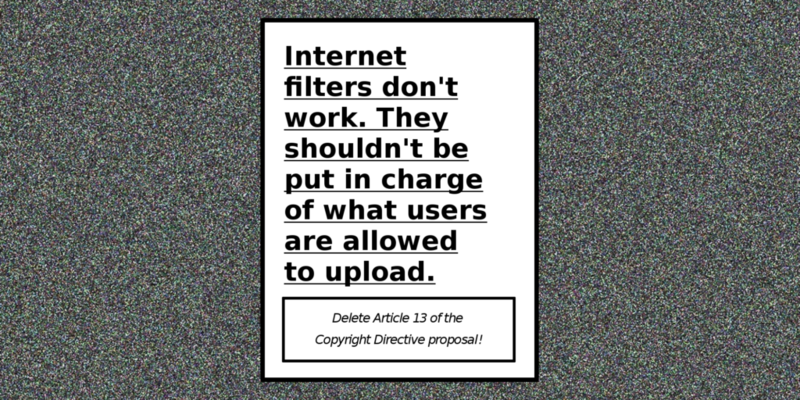 This internet filter is tucked away in a proposal for new European copyright regulation. Internet filters can’t and shouldn’t be used to regulate copyright. They don’t work. But there’s a much bigger problem: once it’s installed, the internet filter can -and will- be used for a myriad of other purposes. We bet you anything that policy makers are gleefully awaiting the internet filter in order to use it in their latest battle, be it fake news, terrorism or undesirable political opinions. It’s an attack on your freedom of expression. You will have to get permission to speak. Platforms will be incentivised to avoid risk – at the cost of your freedom. 15 years ago this day, on 29 January 2003, we published our very first EDRi-gram. To celebrate this occasion, we are looking back at the articles in this first newsletter. A lot has changed, a lot stays the same. In 2003, we had just escaped one of the biggest threats to the internet in Europe, the so-called “web caching ban”. Copyright fundamentalists tried to ban the incidental copies made by networks, unless they were separately authorised. In 2018, we are facing one of the biggest threats to the internet in Europe. Copyright fundamentalists are trying to force everything uploaded to the internet to be subject to prior authorisation and/or upload filtering by internet hosting services. In 2003, we were at the start of a long campaign by certain EU Member States to impose mandatory data retention, using the proposed ePrivacy Directive as a tool to achieve this goal. In 2018, and despite two European Court rulings rejecting mandatory data retention, we are faced with a campaign from certain EU Member States to impose mandatory data retention, using the proposed ePrivacy Regulation as a tool to achieve this goal. In 2003, European activists were faced by a massive, lobby-driven, well-financed attempt to impose software patents in Europe. The proposal was ultimately rejected, in one of the most unlikely of all “David and Goliath” successes of European activists. In 2003, the UK government was trying to impose national ID cards through the back door via a national public service “entitlement” card. In 2018, the Irish government is trying to impose national ID cards via a (“mandatory but not obligatory”) national public service entitlement card. In 2003, the German authorities were pushing censorship through the demonstrably ineffective use of blocking by internet access providers. In 2018, the German authorities are pushing censorship through the coercion of internet services to delete content more quickly. Oh no! Did you miss the 363 previous editions of the EDRi-gram? No worries, you can read all of them here and here. And it’s of course never too late to subscribe to our newsletter! On 20 December 2017, EDRi member Iuridicum Remedium (IuRe) filed a request with the Constitutional Court of the Czech Republic to revoke the Czech data retention related legislation. The filing of the request was achieved in close cooperation with the Czech Pirate Party, whose 22 deputies were for the first time elected to the Chamber of Deputies of the Czech Parliament in October 2017. Apart from the Czech Pirate Party, the proposal also won the support of Members of the Parliament across five other parties represented in the Chamber of Deputies. Altogether, 58 signatures were gathered. The proposal was prepared also thanks to means granted by the Digital Rights Fund. It builds on a similar successful proposal filed by IuRe with the Constitutional Court of the Czech Republic in 2011. In 2012, a new data retention system was adopted that implemented the EU Data Retention Directive that was in force at that time. The recent proposal aims at revoking this new law. The proposal challenges, in particular, the Electronic Communication Act, the Police Act and the Criminal Procedure Act as well as the implementing legislation which defines the range of data to be kept. Currently, operational and localisation data on electronic communications are stored for six months. Apart from the police and other law enforcement bodies, intelligence agencies, as well as the Czech National Bank, may use the data. According to the Czech Telecommunication Office, for example, mobile phone data were requested in over 470 000 cases in 2016 alone. The complaint to the court considers the principle of general and indiscriminate data collection a fundamental problem. It relies on two key decisions made by the Court of Justice of the European Union (CJEU) – in cases Digital Rights Ireland and Watson/Tele 2. In both cases, this measure was rejected. The proposal also explains that Czech and German statistical data demonstrates that the absense of data retention did not affect the level of criminality nor the number of criminal cases solved. The proposal also suggests revoking of selected sections of the Police Act that allow data to be requested without court permission. Furthermore, it suggests revocation of selected parts of the Code of Criminal Procedure, which do not sufficiently limit the possibility of requiring data related to serious crimes only. Based on IuRe’s experiences from 2011, the decision of the Constitutional Court of the Czech Republic can be expected in approximately one year time. Documents made publicly available through EDRi member Statewatch reveal that EU Member States are exploring all possible options to keep, and in fact expand, their current data retention regimes. The general plan is based on a new concept of ”restricted data retention”, which is really blanket data retention with a new name, along with amendments to the draft e-Privacy Regulation to facilitate blanket data retention. Member States are considering whether these new elements should be introduced through an EU instrument or through national law in each Member State. On 15 September 2017, the EU Counter-Terrorism Coordinator (EU CTC) submitted a new data retention proposal to Member States. The proposal was discussed at a meeting of the Working Party on Information Exchange and Data Protection (DAPIX) Friends of the Presidency (FoP) on 18 September 2017. A partial report of the discussions at the DAPIX FoP meeting can be found in Council document 13845/17. The judgement of 21 December 2016 by the Court of Justice of the European Union (CJEU) in the Tele2 case (joined cases C-203/15 and C-698/15) concerned the national data retention laws that are still in place after the annulment of the Data Retention Directive in 2014. The EU CTC notes that data retention cannot be ”general and indiscriminate retention of all traffic and location data of all subscribers and registered users relating to all means of electronic communication” since this would violate paragraph 134 of the Tele2 judgement. In the Tele2 judgement (paragraphs 108-111), the CJEU outlines a targeted data retention regime which does not include every subscriber. The EU CTC, considering input received from Member States, makes it clear that he is not at all interested in targeted data retention. Instead, the EU CTC proposes the concept of ”restricted data retention” on the basis that it is necessary to fight terrorism and serious crime, including cyber attacks. This measure has to be limited to the strictly necessary and be based on objective evidence. However, according to the EU CTC, the measure can cover the entire population, even though this is quite obviously blanket data retention. The justification for this is claimed to be paragraph 106 of Tele2, which states that data retention must be restricted to (i) particular time periods and/or geographical and/or a group of persons likely to be involved, in one way or another, in a serious crime or (ii) persons who could, for other reasons, contribute, through their data being retained, to fighting crime. In essence, the EU CTC argues that the entire population, perhaps with an opt-out for persons bound by a legal obligation of professional secrecy (such as lawyers, journalists and doctors), could fall under the second category, ”persons who could, for other reasons, contribute, through their data being retained, to fighting crime”. While deliberately covering the entire population, the EU CTC emphasises that other aspects of the data retention measure must be limited to what is absolutely necessary. What this means is not clear from the proposal, but it could include some differentiation with respect to categories of data and service providers. Minor operators, such as WiFi access points at pizza restaurants could be excluded since that data ”may potentially not be indispensable for retention”, as the EU CTC carefully notes. As far as the purpose limitation is concerned, there is nothing novel about the reinvention of restricted data retention. The annulled Data Retention Directive also limited data retention to the purpose of investigation, detection and prosecution of serious crime. The DAPIX FoP meeting report mentions that, while the CJEU rules out general data retention, it “does not solely permits” (sic) targeted data retention (which appears to mean that data retention that is not forbidden by the ruling may be permitted). Therefore, there are other legally possible regimes for non-general data retention. This is undoubtedly true, but largely irrelevant. Since the proposed unrestricted yet “restricted” data retention covers the entire population, it cannot possibly be classified as non-general data retention. The DAPIX FoP report refers to the proposed concept as ”restricted data retention and targeted access”, but the Tele2 judgment makes it very clear that safeguards and limitations at the access stage are not sufficient and cannot justify blanket (general) data retention. The proposal from the EU CTC contains some general comments about the data categories (communication services) to be retained. It is claimed that approaches in some Member States show that a number of data categories are indeed not necessary (and, by implication, illegal). The new focus on cyber attacks, where data retention is claimed to be key for attribution and investigation, could easily lead to more retention of internet traffic data, in particular, perhaps even internet connection records as in the UK Investigatory Powers Act (information about every internet packet, including all destination IP-addresses). Moreover, Europol has recently complained about the unavailability of data from internet service providers that use Carrier Grade network address translation (CG-NAT) since a large number of subscribers may share the same IP address. Data retention requirements to address the technical limitations caused by CG-NAT would, in most cases, substantially increase the amount of data collected. The DAPIX FoP report describes a matrix with categories of data to be retained, for example content data, traffic data, location data, and subscribers’ data. Except for content data (where generalised data retention would, incidentally, not respect the essence of the fundamental rights), this is simply the list of data categories in the annulled Data Retention Directive and the current data retention laws in Member States. In summary, the proposal of the EU CTC could easily lead to more data being retained per subscriber, despite the claim that a “peeling off” approach is taken to limit the data categories. Data retained for business purposes, such as billing data, will be complementary to the data covered by the mandatory data retention regime. The EU CTC foresees that the new mandatory data retention regime will also cover over-the-top (OTT) service providers like Google and Facebook, and it is noted in the proposal that OTT operators collect much more data for business purposes than traditional telecommunications operators. In this connection, the EU CTC fails to mention (or, possibly, understand) that the proposed e-Privacy Regulation seeks to create a level playing field by subjecting all electronic communications service providers, whether OTT or telecommunications providers, to the same privacy rules. The proposal from the EU CTC respects the strict access conditions set out in the second part of the Tele2 ruling. Access to retained data must be solely for the purpose of fighting terrorism and serious crime and must be subject to a prior court review. With the exception of terrorism cases, access can only be granted to data of individuals suspected of involvement in serious crime (Tele2 paragraph 119). The EU CTC also mentions pseudonymisation and encryption, and that this could facilitate searches of the retained encrypted data with decryption only on the basis of a warrant. The purpose of this is not entirely clear, since the retained data, as the general rule, can only be accessed with a prior court review for a specific person. It could perhaps mean that searches of encrypted or pseudonymised data are not intended to count as access to the retained data, and that such searches can be used to find persons of interest who can then, under certain substantive conditions, be depseudonymised subject to a court review. If data on specific persons could only be accessed after a prior court review, there would not really be a need for encrypted searches. Encryption is, of course, a useful security measure for the stored data, but that is an entirely different issue. In the final part of the proposal, the EU CTC considers the role of the draft e-Privacy Regulation in relation to restricted data retention. The EU CTC notes that the Tele2 judgment is stricter than the annulment of the Data Retention Directive since Article 15(1) of the e-Privacy Directive makes data retention an exception to the main rule of erasure once the communication is completed. The EU CTC hypothesises that the draft e-Privacy Regulation could be amended to make blanket data retention easier. According to the EU CTC, it should be considered to allow storage of communications data in Article 7 of the draft e-Privacy Regulation if legally required to assist governments to fight serious crime and terrorism. However, a provision of this type would still be a restriction on the fundamental rights to privacy and data protection of subscribers, and the restriction would have to satisfy the conditions of Article 52(1) of the Charter of Fundamental Rights. This would not necessarily be different from the current situation with Article 15(1) of the e-Privacy Directive or Article 11 of the draft e-Privacy Regulation. A recently published Eurojust report on data retention in Europe confirms that EU Member States failed to make meaningful progress towards complying with fundamental rights standards, as clarified by the two Court of Justice of the European Union (CJEU) rulings banning blanket data retention. The CJEU has delivered two rulings on mandatory data retention of traffic and location data (metadata) for electronic communications services. In the Digital Rights Ireland judgement of 8 April 2014 (joined cases C-293/12 and C-594/12), the Data Retention Directive 2006/24/EU was declared invalid. This was followed by the Tele2 judgement of 21 December 2016 (joined cases C-203/15 and C-698/15), where the CJEU ruled that Article 15(1) of the e-Privacy Directive, read in the light of the Charter of Fundamental Rights of the European Union, precludes national laws which require general and indiscriminate retention of metadata (blanket data retention). Only targeted data retention is allowed under EU law. A month after the Tele2 ruling, the Council Legal Service sent an analysis of the judgement to Member States, where it concluded that ”a general and indiscriminate retention obligation for crime prevention and other security reasons would no more be possible at national level than it is at EU level, since it would violate just as much the fundamental requirements as demonstrated by the Court’s insistence in two judgements delivered in Grand Chamber”. This was a clear message to Member States who had hitherto claimed that the annulment of the Data Retention Directive in April 2014 did not affect their national data retention laws. When the analysis of the Legal Service was released to the public on 27 March 2017 (Council document 5884/17), the paragraph containing this critical sentence was redacted. Despite the clear judgement in the Tele2 case, blanket data retention laws are still in place in most Member States. EDRi member Privacy International surveyed 21 national data retention laws and examined their compliance with fundamental rights standards. None of the 21 laws are currently in compliance with these standards, as interpreted by the CJEU judgements in Digital Rights Ireland and Tele2. This conclusion is confirmed by a recent Eurojust report ”Data retention regimes in Europe in light of the CJEU ruling of 21 December 2016 in Joined Cases C-203/15 and C-698/15” (Council document 10098/17, LIMITE) which was made publicly available by EDRi member Statewatch on 20 November 2017. The Eurojust report covers 25 EU Member States (as well as Norway and Switzerland), and is based on a detailed questionnaire sent to members of the European Judicial Cybercrime Network (EJCN) in March 2017. According to the survey, five Member States (Austria, the Netherlands, Romania, Slovenia and Slovakia) do not currently have mandatory data retention, as their previous laws were invalidated by constitutional or high courts in accordance with the CJEU judgement on the Data Retention Directive. For the remaining Member States that responded to the survey, the Eurojust report concludes that “none of the countries have national legislation that obliges the targeted retention of data linked to specific persons or geographical locations”. In other words, their national data retention laws cover all subscribers, which is illegal under EU law. Some respondents indicated that “they considered that their data retention regime is targeted by virtue of the limitations set with regard to retention periods and/or reason for the data retention”. However, this notion of “targeted” is rejected by the Eurojust report, as it is clearly not in line with the standards of the Tele2 judgement. For access to the retained data, the majority of respondents state that a judicial review is required before access is granted. The replies also state that access is granted depending on the seriousness of the crime being investigated. The Eurojust questionnaire does not ask the respondents whether access to the retained data, as a general rule, can only be granted to “data of individuals suspected of planning, committing or having committed a serious crime or of being implicated in one way or another in such a crime”. This is a requirement in the Tele2 judgement (paragraph 119), except in terrorism cases. Respondents of the Eurojust survey were also asked about the impact of the CJEU judgement in relation to the admissibility of evidence in court. Five countries reported on court rulings where the admissibility of evidence from data retention was evaluated by the court. So far the evidence has been deemed admissible by courts, although one of the five cases (in Ireland) is still pending on appeal. This part of the Eurojust report shows a clear concern that evidence obtained from illegal data retention could one day be ruled inadmissible by courts. The legal uncertainty regarding the admissibility of evidence obtained from data retention is by no means surprising. Unless Member States quickly amend their data retention laws to bring them into compliance with the CJEU standards, it is reasonable to expect that there will be more challenges to the admissibility of the evidence. Even if national courts generally allow illegally obtained evidence in specific cases, the courts may eventually rule differently when prosecutors consistently submit evidence that is only available because of illegal data retention laws. The fundamental right to a fair trial may certainly be questioned if the state systematically relies on evidence that is obtained in violation of established human rights standards. Finally, the Eurojust survey asks about initiatives at the national level to change the data retention legislation. In ten Member States, a review or assessment of the legislation is ongoing, and three Member States are in the process of drafting amendments. The Eurojust report also outlines the substantive legal changes being planned or considered by Member States. Most of these seem concerned with access to the retained data, such as limiting access to serious crime only. This would address a narrow reading of the 2014 Digital Rights Ireland ruling, whereby blanket data retention may be understood as theoretically possible if sufficient safeguards for access are put in place. With the 2016 Tele2 ruling that interpretation is clearly rejected by the CJEU. Only one Member State (Austria) specifically mentions the introduction of targeted data retention and quick freeze. Informal remarks of the respondents show a clear preference for blanket data retention with arguments that it is impossible to determine in advance the individuals who will commit crimes and thus the data that needs to be retained. There are also claims that storing data indiscriminately for all citizens is more acceptable since the alternative, targeting specific persons or particular geographical locations, could result in criminal investigations that are considered discriminatory. Some respondents also indicated that the necessary balance is already guaranteed by the limitations placed on access to the retained data. The last argument is particularly odd since the CJEU has clearly ruled in Tele2 that restrictions on access to the retained data are not sufficient. The retention of data must also meet objective criteria that establish a connection between the data to be retained and the objective pursued. In particular, such conditions must ensure that data is not retained on everyone (Tele2 paragraph 110). However, this does not mean that “the individuals who will commit crimes must be determined in advance”. The CJEU rulings in Digital Rights Ireland and Tele2 only require objective evidence to identify a public whose data is likely to reveal a link, at least an indirect one, with serious criminal offences (Tele2 paragraph 111). There is also the possibility of retaining data on specific persons or a group of persons at an early stage of an investigation based on evidence or intelligence which does not currently meet the substantive requirements for access to metadata. If the police gathers further evidence to substantiate the suspicion for the person of interest and can make a reasoned request for access to data, retained metadata from the past of the suspected person will become available to the police. However, it will not be possible to “look into the past” of every possible citizen since this will require retention of data on everyone. The CJEU has ruled twice that this practice of mass surveillance is illegal.